Tanto Cuore: Oktoberfest is a game by Masayuki Kudoh, published by Japanime Games. It is for 2-4 players. In this sequel to Tanto Cuore, players move from the mansion to the Beer Fest. It can be played either by itself or combined with the original Tanto Cuore or any of the other expansions. This sequel adds new cards and new card types. For more information on the original Tanto Cuore and how to play it, please follow the link below. It should be noted that in this game the Private Maid cards have been removed. In their place are buildings and beer cards. To begin, the maid chiefs, “Anja” and “Matilde” should be removed from the deck and placed in separate piles in the Town (space in the middle of the table where all the cards are located). The 3 types of love cards should be placed in separate piles in the Town. 10 of the 18 general maids are chosen, either randomly or by choice and placed in separate piles in the Town. It’s suggested for the first game to use the recommended selection of maid cards. The remaining maids are returned to the box. The Oktoberfest card should be removed from the beer cards which are then shuffled and placed face down beside the “Matilde” pile. The Oktoberfest card is now placed beside the Beer pile face up. The three types of event cards should be sorted out and placed in separate piles in the Town. Each player is then given 7 of the “1 Love” cards and 3 “Matilde” cards. The player shuffles these cards together to form their deck. They will then draw the top 5 cards into their hand. The first player is chosen and play now begins. Just like the original game, this one follows the same 4 phases of a player’s turn. For more information on the step by step process of a player’s turn, please check out the link above. Now then, there are a few changes and additions which I’ll cover here. First off there are beer cards. These cards are gained through the use of a bar maid or beer stand. They can also be gained from an opponent playing a “Get Drunk” or “Let Me Drink” card. When a bar maid is played the player pays the requirement and can then gain a beer card. When a beer stand is gained, all player may gain a beer card during their employ phase if they’re willing to pay the cost. When gaining a beer card, the player is able to choose to take either the card from the top of the beer pile or one of the face up beer cards beside the beer pile. Once a beer card is gained, it is read aloud and then placed face down into the player’s private quarters. If the card has an effect it, this will now take place. The player shows their opponents the card and then resolves the effect. If the face up card is taken, the player must replace it by flipping over the top card of the beer pile face up. If a “Beer Stand” or “Get Drunk” is revealed, the effect must be immediately resolved and the player must then refill one more beer card. Another aspect of beer cards is the alcohol value. If a “Get Drunk” card is revealed or the “Ute Krombach” maid card is played, the player may have to count up their alcohol value. To do this, the player adds up the alcohol value of each card in their private quarters. Once this is finished, the beer cards are returned to the player’s private quarters face down. Also included in this game are events and building cards. Event cards are treated the same way as they were in the original game. Once bought, these cards can go to any player’s private quarters as decided by the player. Certain event cards are placed onto a maid or a building card directly. They will remain there till another effect would remove it, then it’s returned to the Town. Building cards are placed in a player’s private quarters once they’re bought. They’ll stay there until another card effect removes it. Like with the original, the game continues until two of the maid piles in Town have run out. However, the game can also end if the beer pile runs out. The game then ends once the current player finishes their turn. Scoring is pretty much the same with one exception, beer cards must have their victory points added in with the other cards to get the player’s total score. In the end, the player with the most points is declared the winner and crowned the “Perfect Master”. Like the original Tanto Cuore, this game only comes with a large set of cards. The cards are really nice looking and have some great looking artwork. The anime and manga style art is very prevalent on each card. Like in the original title, there are a few cards where the artwork is a little bit much, but not anything that teens or adults should really have a problem with. As for the younger players, this might not be the best for them. Of course, everything is up to the player’s discretion. Just be aware of it either way. Fans of anime and manga should really enjoy the art designs. The iconography is fairly easy to understand and shouldn’t be a problem to learn for new players. Those players that already have some experience with any of the other Tanto Cuore games should find this just as easy. Overall, I like the designs and artwork. Everything looks really good. Much like the original Tanto Cuore, the rulebook for this game is also in black and white. However the design is a little better. The original was larger and had to be folded to fit into the game box. This version is designed like the rulebooks for games like Random Encounter. The pages are actually the width of the box instead of being twice that size. That’s a definite improvement. This makes the book a little thicker but I’d rather have a thicker book than one with a crease or fold running through the middle of each page. There are plenty of pictures and examples throughout the book, but of course the pictures are only black and white. All of the terminology used in the game is explained so that the original intent is very clear. Each of the different card types are explained in great detail as are the different phases of game play. There are also some optional rules for playing with 2 players as well as for combining this game with any or all of the other Tanto Cuore games. The book also contains a visual reference of each card included with the game and explanations of how each one works in detail. I find this to be a great reference, especially if you’re just learning the game and need to figure out a particular card’s icons or for rules clarification. Overall, the book is well designed and looks really nice. However I really wish there had been some color pictures instead of the black and white. Still it’s not too bad. As I’ve stated numerous times, I like deck builders. This one is no different. I like it. It does tend to have that same Dominion feel to it that is prevalent in the original Tanto Cuore. If you’re familiar with that game then you’ll not have a lot of problems with this one either. This one does leave out the Private Maids that were included with the original game. That means that if you want to play with them, you’ll have to have one of the other games to add with this one. What it does new is the beer deck. I’m not a drinker but I kind of like what this brings to the table. It’s a pretty cool addition and it’s quite fun, in a silly kind of way. I do wish that there were more maid cards that add beer cards seeing as there are only 2 that do this. I’d have thought that with this being the main addition that you’d at least see a hand full of maid cards that used the mechanic. Unfortunately that’s not the case. Thematically it’s fun and gets the feel just right. Fans of anime and manga style artwork should love this game. Deck building fans will enjoy the Dominion like mechanics. I really like the blend of styles and the overall look and feel of the game. While I wish there was a bit more to it, this one still does a pretty good job of changing up the flavor of the original game. Overall, I’m pretty happy with the game. 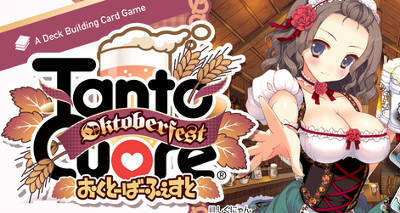 Tanto Cuore: Oktoberfest is an self contained expansion to the original Tanto Cuore game. It is an anime and manga style game that doesn’t take a very long time to play. Most game sessions last around 45 minutes or so. The cards are designed really nice and the artwork is really fun. I really like the manga and anime style so these cards look great. I will say that a few cards are a bit over the top but nothing so bad that should bother anyone except for possibly younger players. The game isn’t difficult to understand or to play. Any players that are familiar with Dominion should have no problems here. 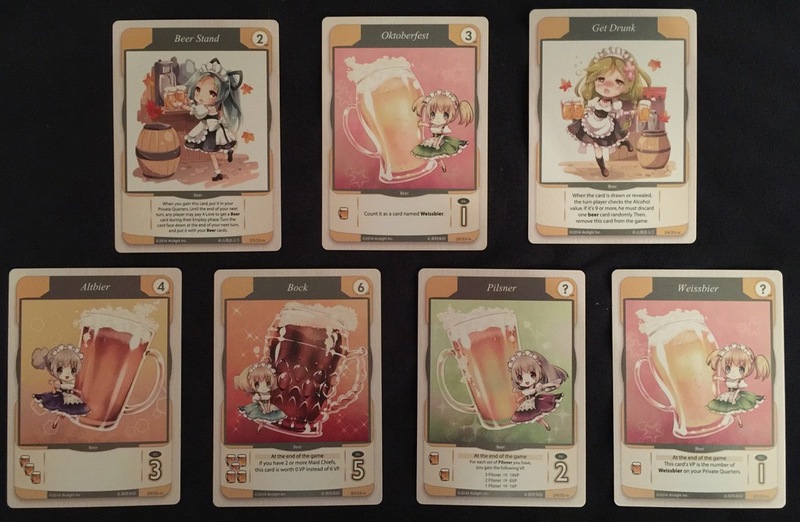 I really like the additions to the game with the beer deck and beer maids, however I wish there’d been a few more beer maids. Something else to be aware of is the lack of private maids in this expansion. If you want to be able to play with them, you’ll need to add them from a different expansion or the main game. It would have been nice to have them included, but not a necessity. 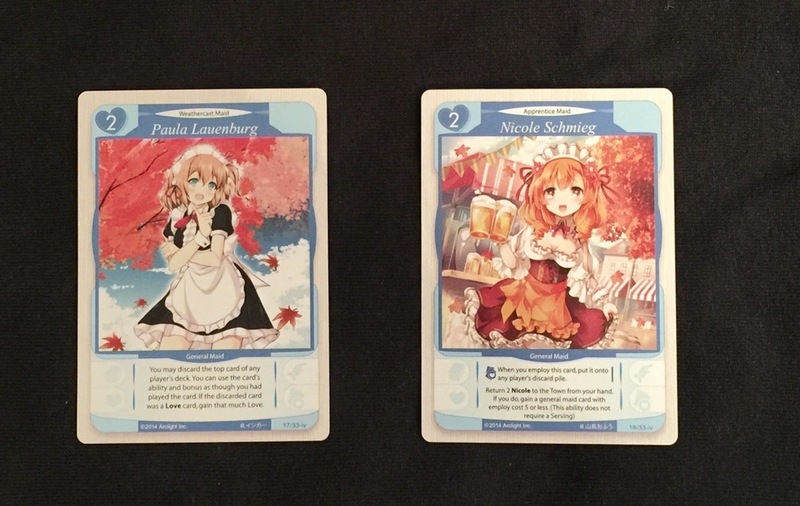 Fans of anime and manga should enjoy the game as well as Dominion or other deck building fans. I highly recommend this game, especially if you have any of the previous games. It’s a really fun deck builder that works well by itself but is even better when added with the main game. Overall it’s a really solid expansion. This entry was posted in Reviews and tagged board, board games, card, card games, cuore, games, japanime, japanime games, kudoh, masayuki, Masayuki Kudoh, oktoberfest, tanto, tanto cuore. Bookmark the permalink.